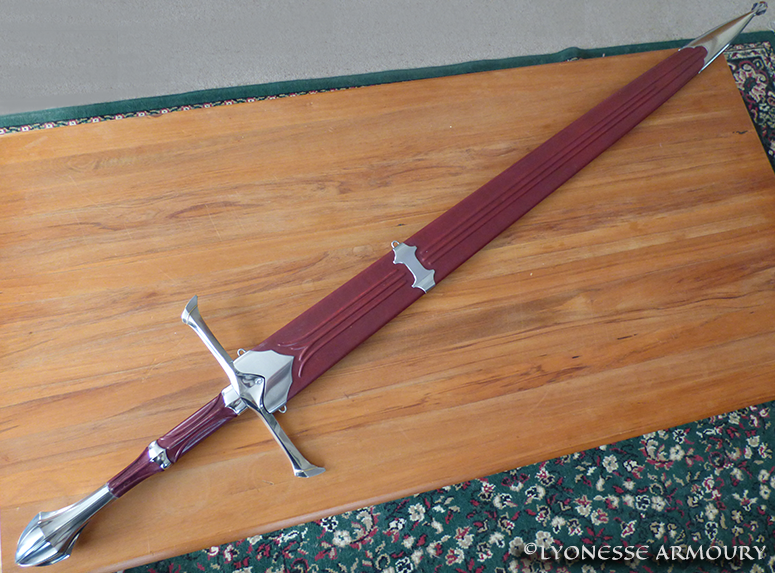 This is a large fantasy leaf-bladed sword and scabbard that I finished in 2016. 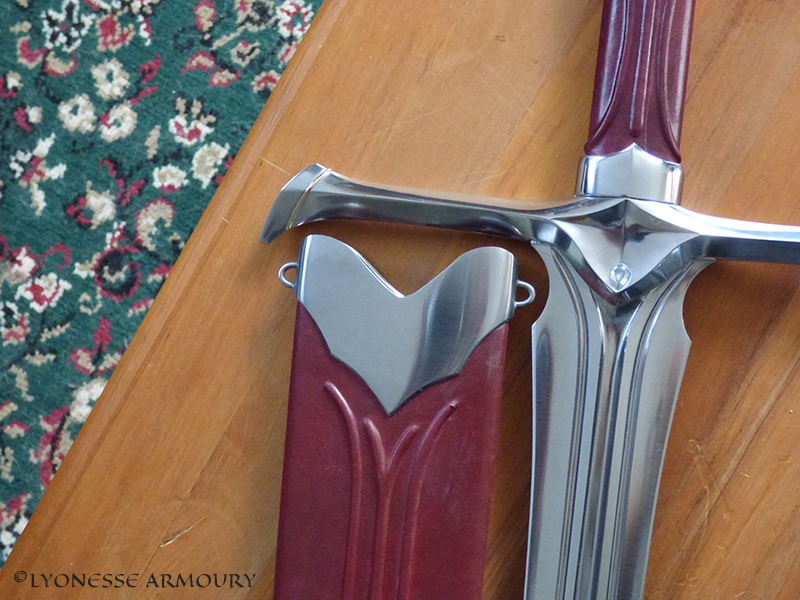 It is an excellent example of the collaboration between the craftsman and the client when swords are made as a one-off commission. 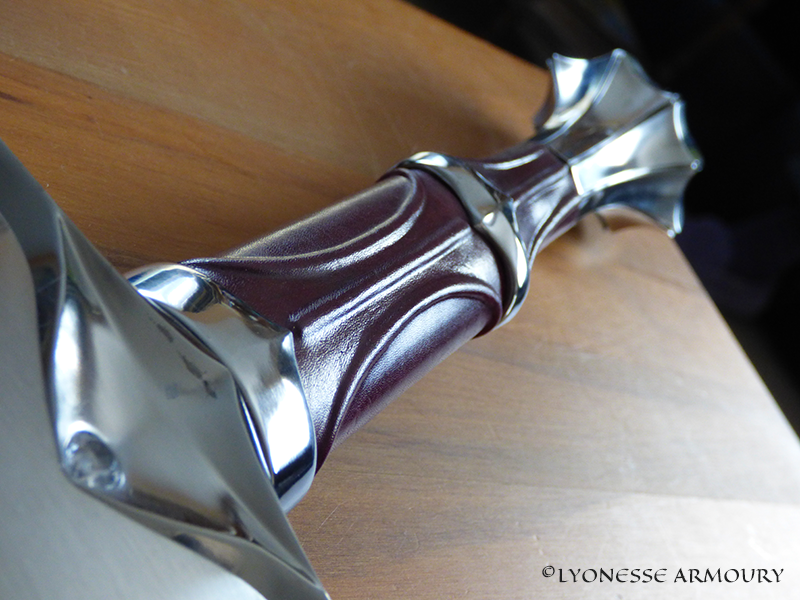 The client wanted a large leaf-bladed sword, with a scabbard. Together we went through a design process to get the right look and a balanced design, one that would be both a beautiful heirloom piece but also a practical and functional sword. 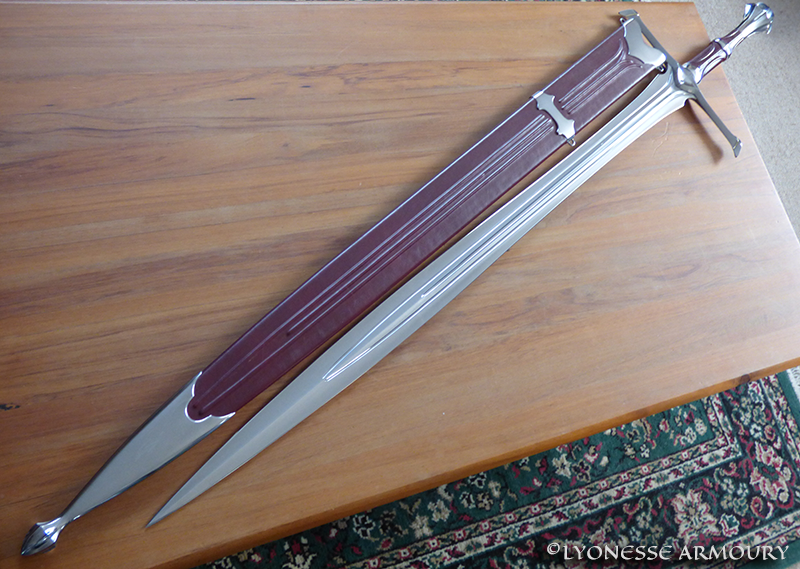 I like large leaf blades (and two handed swords in general), even though (or perhaps because) leaf blades were not used much in the age of steel. Early leaf blades of bronze tended to be shorter one handed weapons. When steel technology advanced to the point that a longer leaf blade could be made strong enough to survive combat, different sword types were being used in Europe. The challenge when forging a leaf blade is to make it light enough to balance without the need for a huge pommel. Otherwise the whole sword gets too heavy and unwieldy. The way to do this is to keep the spine thick through the waisted section to keep the blade stiff enough, Then grind the spine as thin as possible through the widest part and towards the tip, to keep the weight down and get an even flex through the length of the blade. 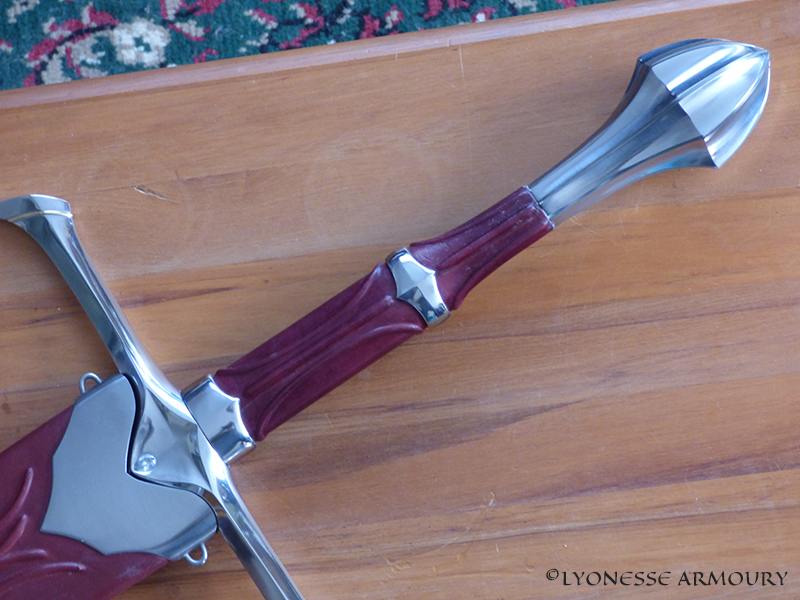 The final sword was lighter and better balanced than I had expected, and very easy to wield. 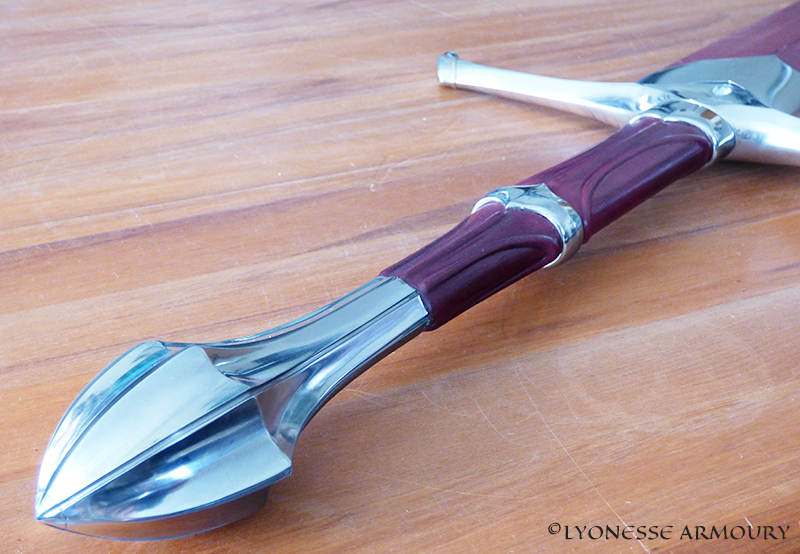 Balance: 90mm (3.5”) along the blade. Torque on wrist is 19566 gram-centimetres, which is good for a two hander. 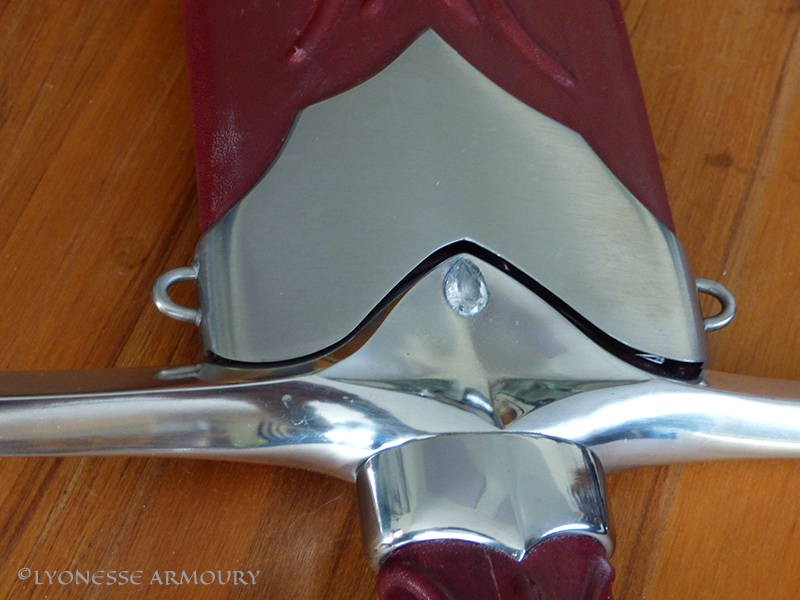 Note the detail at the end of the scabbard, mirroring the pommel design. This whole design was about taking a symmetrical sword and creating details that draw the eye to different parts as you look along it, blending the different components together in a way that is both functional and pleasing. The blade is hollow ground to catch the light from all angles and minimise the weight, The three narrow fullers draw the eye to the hilt where they curve out to each side of the handguard; the three lines are echoed in the risers on the scabbard. The central block of the handguard has hollowed faces with cubic zirconia stones set in them, and the rest of the handguard draws shapes and angles to draw the eye out to the tips. The grip has a strong central line to match the blade and pommel, but has stretched ovals to each side that wrap around the side of the grip. The shape of the grip is very practical, with a straight section near the blade for a strong foregrip, and a waisted section that continues in the curve of the pommel, and allows a looser grip with the back hand that improves the maneuverability of the sword. 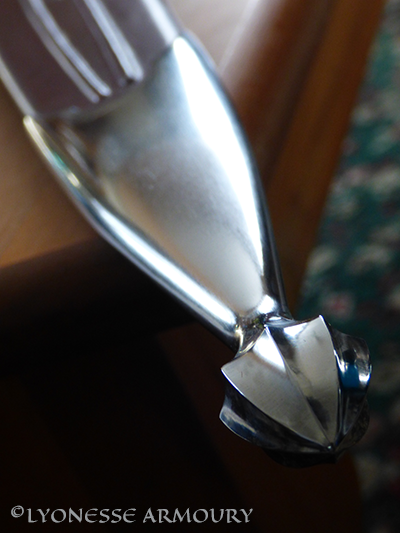 The risers of the grip are matched into the cut-in lines and hollows of the grip, and the scabbard tip itself mimics the shape of the pommel.